You can sort the data in your Word 2007 tables. This is useful if you want to present the data in sequence. For example, you might want to show a table that lists employees in order by the employees’ names. Fortunately, Word includes a Sort button that lets you do just that. 1Select the rows you want to sort. For the best results, select entire rows and leave out any heading rows you don’t want sorted. Usually, you want to sort the entire table except for headings. This is found in the Data group on the Layout tab. The Sort dialog box comes up. 3Set the column you want to use to sort the table and select the type of sort you want. 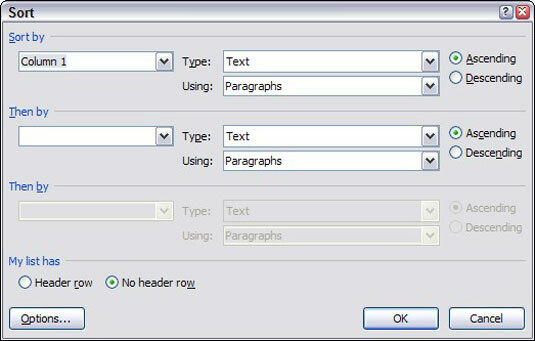 4If your selection includes a heading row that you don’t want sorted, select the Header Row option. You can keep that row as is. Word sorts your data according to the choices you made.